Be.Lead.Do! is an online training program for people who want to become better leaders and decision makers in various industries. The Be.Lead.Do! 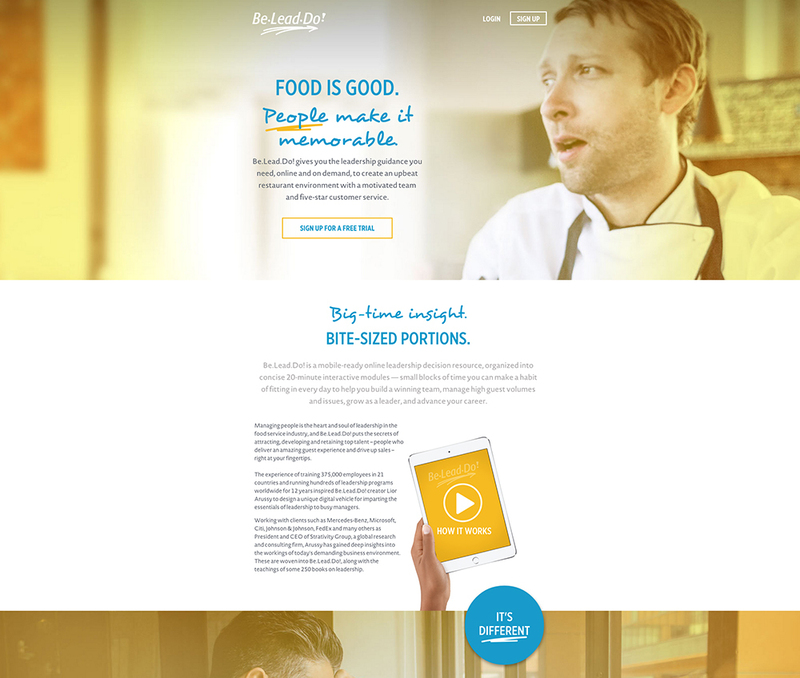 landing page for the food services industry is a good example of using powerful imagery and compelling copy to prompt visitors to follow through with a clear call to action. This page’s entire purpose is to get visitors to sign up for a free trial of the Be.Lead.Do! program. The entire page prompts just one, clear call to action (i.e. “Sign up for a free trial”). Even though there are four buttons on the page, each one prompts the trial sign up. The copy on the page is benefit driven. The target audience in this case really cares about having a high-performing team, a good restaurant environment, and five-star customer service. The info provided about the program is detailed enough to convert. All of the supporting benefit copy on the page appeals to a methodical buying persona. It will convert those driven by details and logic. There are only three pricing options displayed. By presenting only three options, Be.Lead.Do! avoids overwhelming their visitors. This makes conversion more likely as prospects don’t have to overthink. The high-quality images. From the hero shot at the top of the page, to the other large images – these shots reinforce context (i.e. this is a page for those in the food industry who want to learn), and they establish credibility with a professional look. The video link points to Vimeo. While having a video on your page is great for conversion (as long as it clearly prompts your CTA), the play button on this page points to Vimeo where users can become distracted and driven away from this landing page’s goal.